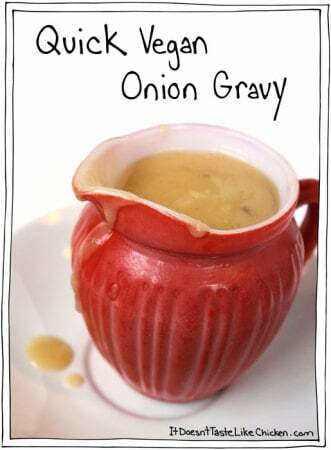 This vegan gravy is so yummy, you'll want to pour it over everything! In a medium sauce pan melt the vegan butter over medium heat. Sauté the onion in the butter until the onion is caramelized. If you're in a rush, you can do this quickly, but the slower you go, the more rich the flavour will become. Mix in flour and cook for 1 minute. Now whisk in the broth and cook until the gravy thickens. Add soy sauce or tamari to taste if needed, this will also make the colour a richer brown.